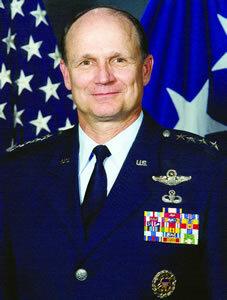 General Gregory S. Martin is Commander, Air Force Materiel Command, Wright-Patterson Air Force Base, OH. The command conducts research, development, test and evaluation, and provides acquisition management services and logistics support necessary to keep Air Force weapon systems ready for war. Martin was born in Fort Myer, VA, and graduated from Landon High School, Bethesda, MD, in 1966. He earned a Bachelor of Science degree from the U.S. Air Force Academy in 1970 and a master's degree in business management from Central Michigan University in 1977. He entered the Air Force in June 1970 with a commission from the U.S. Air Force Academy. In addition to flying 161 combat missions in Southeast Asia, he commanded the 67th Tactical Fighter Squadron, the 479th Tactical Training Wing, and the 33rd and 1st fighter wings. He also served as the Joint Staff's J-8 vice director and the Air Force's director of Operational Requirements. Before assuming his current position, he was Commander, U.S. Air Forces in Europe; Commander, Allied Air Forces Northern Europe; and Air Force component commander, U.S. European Command, Ramstein Air Base, Germany. Martin is a command pilot with more than 4,100 flying hours in various aircraft, including the AT-38, F-4, F-15 and C-20. Interviewed by Jeffery McKaughan, MAT editor. Q: Good morning, General Martin. You have logged quite a few miles visiting various AFMC locations since assuming command. What has struck you the most during your travels? Do you see your schedule slowing down much in the coming months? A: I've visited most AFMC locations, and the one thing that's struck me most is that we have some of the most talented people in our Air Force. We have good leaders, good team builders and the most enthusiastic people with a very positive attitude. We've got an important mission! I relish the opportunity to work with some of the world's finest technical and military professionals. We know what the warfighter needs and we've got the people in AFMC who are going to meet those needs promptly and accurately. Q: Through its labs and product centers, AFMC can energize a tremendous amount of RDT&E resources to support the warfighter. What are some of the key technology programs that you will target your resources toward? A: One of our focuses is on lasers and related directed energy technology. This is an area where more developments are about to burst onto the scene-everything from laser communications, to advanced lasers for tactical weapons, to new uses for solid-state lasers and high-power microwaves. Development of the airborne laser has been one of our biggest laser-based programs. Nanotechnology and biotechnology are other areas where we're concentrating. Both of these fields are looking at designing and manipulating matter at the molecular level to design novel materials, sensors and systems. In biotechnology, we are delving into biomimetics-learning more about how nature has solved a problem and how we can emulate it. For example, pit vipers possess incredible heat-detecting capabilities without the need for cryogenic cooling. We're also researching the feasibility of self-healing materials and self-assembly just as our cells do. Active denial technology is another area we're working. This is breakthrough, non-lethal technology that uses millimeter-wave electromagnetic energy to stop, deter and turn back an advancing adversary from relatively long range. It is expected to save countless lives by providing a way to stop individuals without causing injury, before a deadly confrontation develops. These non-lethal technologies can be used when lethal force is undesirable. Protection of defense resources, peacekeeping, humanitarian missions-these are all areas where we can benefit from this technology. This technology uses a transmitter to send a beam of energy toward an identified subject. Traveling at the speed of light, the energy reaches the subject and penetrates less than 1/64 of an inch into the skin. This heats up the skin's surface. Within seconds, the person feels an intense heating sensation that stops when the transmitter is shut off or when the individual moves out of the beam. Despite the skin's sensation, the technology does not cause injury because of the low energy levels. The feeling is almost like briefly touching an ordinary light bulb that has been left on for a while. I know for a fact that this technology is safe and it works, although I only got to try it on my hand. We also have a target identification demonstration system, developed by the Directed Energy Directorate High Power Microwave Division at Kirtland Air Force Base, NM, that incorporates different technology. Ping-the target identification system-provides improved target identification capabilities over other system designs for use in difficult environments such as urban warfare and homeland defense. This technology has a capability to detect and identify specific moving or static targets concealed by clothing, foliage, other people, buildings or other static targets. This technology is critical for both military forces fighting in urban and tactical terrain and for the law enforcement community dealing with domestic and terrorist acts. Q: How does AFMC coordinate the needs of the warfighter with the "fruits" of scientific development to make sure that what is being developed is what the warfighter wants and needs? A: When I came to AFMC, I made a commitment to continue to improve the speed in which we deliver the latest science and technology innovations to our warfighter. But long before we can deliver, we've got to ask ourselves, "Are we doing everything to ensure the warfighter has the absolute best information and the best weapon systems to know the battlespace, to protect themselves and to keep the enemy from accomplishing their objectives?" We are now focusing our science and technology staff in a way like never before-on technology activities that provide high leverage and high payoff. It's an analysis process to give us better insight into the right paths to breakthrough technology. For example, lasers were very advanced but not practical until we developed adaptive optics. Now they're becoming practical for military application. One-That you can have battlespace awareness at the touch of a screen. Two-That the information will be presented so that you can make immediate decisions at the level of your authority. Three-That you can execute an action that will achieve discreet effects in near real-time. So you know what the battlespace is like, you see it presented in a way that gives you the right picture and the right options and the right likely consequences, and that you have the equipment to take action now, whether it's directed energy, whether it's hypersonics or whether it's omnipresent force over the top. Q: As far as funding, do you see AFMC continuing to receive the same levels of RDT&E funds as in the past? A: Air Force RDT&E funding is important to our transformation in the 21st century. The Air Force is committed to transformation even as we continue to conduct significant operations around the world. S&T is the earliest part of the RDT&E process, and the Air Force continues to increase S&T funding as our overall top line increases despite tough competition for funds. Inside of S&T, we have been increasing the percentage of our funding that supports space for several years and I plan to continue this. The Air Force's space systems are increasingly important to our overall operations around the world and we need to maintain our edge in space. Q: I would assume that acquisition reform is a never-ending process, as one always strives for improvement. That being said, where do you think AFMC is in terms of its acquisition reform efforts? A: As you know the Air Force acquisition process, like most processes, is continuously maturing. One of the biggest changes to our acquisition process is the program executive officer restructuring. Through the PEO restructuring, we are dual-hatting the PEO and the product center commander, so the one person who has program management responsibility also owns the resources. This is a big deal! They will still work for Dr. Sambur, assistant secretary of the Air Force for Acquisition, with their acquisition responsibilities, but with this other hat on, they'll know what their resources are and apply them to the problem as best they can. The acquisition process is essential for the completion of the AFMC mission of delivering war-winning, expeditionary capabilities to the warfighter: war-winning technology, war-winning acquisition support and war-winning sustainment. This restructure reconnects two great institutions. It's important to keep in mind that these changes are about reenergizing our culture and unleashing more potential from our acquisition community. The bottom line is that our role is to support the execution of programs for the warfighter. Q: What are some lessons learned from OEF and OIF? Number one, I think we all agree that we need to have global access. Who would have thought that you could have attacked Afghanistan, a land-locked country, and you were going to have to go over Pakistan to get there? Remember, we had denied arms to Pakistan for more than 10 years because of human rights considerations. Or that you would go over Azerbaijan, Turkmenistan, Kazakhstan, Uzbekistan-that those nations, part of the former Soviet Union, would not only allow you to over-fly, but many of them would allow you to have bases there? Global access would be very important to us, and particularly when we start to talk about the global war on terrorism. The Air Force needs to be able to stand up and be able to sustain operations from many austere bases at once. That's what our entire network of force protection is-connection, information management, munitions, fuel, medical, food, you name it-everything in an austere location and the capacity to sustain the operations as we have done and did during Operation Enduring Freedom and Iraqi Freedom at 36 different bases. There's no question about the force multiplier effect of the Combined Air Operations Center-the hub for controlling all joint and coalition air operations. The more we grow as a service, the more we realize that we need visualization of the battlespace so that our senior leadership can make decisions instantaneously. We need fully integrated planning and execution. We learned from Anaconda that it can't be parallel. It can't be sequential. All of our services must be involved in the planning and must be engaged in the execution simultaneously. We've learned the value of interoperability. So our systems, whether we've got multi-level security issues, whether we've got tactics, techniques and training down right, all of our systems need to be merged and we have to realize that. We've got to get the rules set straight to begin with respect and security and releasability issues. We need persistence. Theater responsive intelligence, surveillance and reconnaissance, and now strike. Not only is it important to know what's going on and make a decision on what to do about it, but you also have to have the forces available to apply it now. Then last, I think we've all learned the importance of humanitarian ops. The people that you're liberating are the people that are going to build the country back up. Q: Were there any AFMC "developments" that proved to be particularly important to the warfighter in the past few years? A: One of our Air Force Research Lab's developments actually came as a result of lessons learned from Operation Enduring Freedom. The Battlefield Air Operations Kit provides machine-to-machine digital communications to help quickly connect the right aircraft, with the right munitions, guided precisely to the right target, at the right time, to achieve the desired effect. Another development important to the warfighter is advanced laser eye protection. This provides air and ground crews with hazard protection for day-to-day training in addition to threat protection for combat missions. This allows day and night operations without visual glare or eye damage from laser threat. That's a great thing for our warfighters! Q: Challenges are always opportunities. So, do you see any significant opportunities for AFMC while on your watch? A: We as a command are in great demand. Our capabilities are desirable, and we have good people with vision who see us doing even more. Our job is to protect American lives across the complete spectrum of conflict. We can't just focus on cyberwar or nuclear war. We've got to focus on anywhere we have American lives at risk and where the military may be asked to proceed. Unfortunately, we can never predict that. AFMC people must focus on developing integrated capabilities, not on developing stove-piped systems. It's an evolution and we're on the right track for delivering technology to warfighting in three major areas. These areas include knowledge, decision and action in time. Knowledge: The integration of self-queuing machine-to-machine interfaces across our multitude of sensors exemplifies our better use of data.Â Decision, or presentation of information: There is an art to the way we present information so that people can understand it without being overwhelmed with digits and data. We need to be able to present it so that a human can look at it, see the picture immediately and take action.Â And action in time or near-instant desired effects: We must be able to achieve desired effects nearly instantaneously. If we miss the SCUD because it is moved away from where we last saw it or it is launched, all our effort is for naught. Above all, we have to look at where we stand now and determine where we want to be in the future. In order to succeed we have to envision all the points along the way where potential opportunities may come up. Putting thought into these plans ahead of time will ensure that our nation's Air Force reaches its ultimate goal-to win in everything we do.